More from the recent trip to LA. After checking into the hotel in Westwood, I jumped on a bus through Beverly Hills and over to Hollywood. I am from Burnt Oak, ok, so this is pretty much the stuff dreams are made of. An aside, buses in LA are awesome. Most of them only cost a dollar and the various networks go all over the place. It’s almost like it’s a proper city! (I’m being silly, of course it’s a proper city, and that’s why I love it – being from London, LA feels a bit more familiar to me in its massiveness.) You hear all the time that LA is only for the automobiles, but as a tourist, the buses are really excellent. So anyway I went to Hollywood and walked up to the Hollywood Boulevard, where I had last been in 2002. Tinseltown, they call it, but I didn’t see any Christmas decoration shops. It is of course tacky touristy mayhem, mixed in with a fair bit of grime, plus a whole bunch of famous names on stars on the ground. Come on, that is why we go. 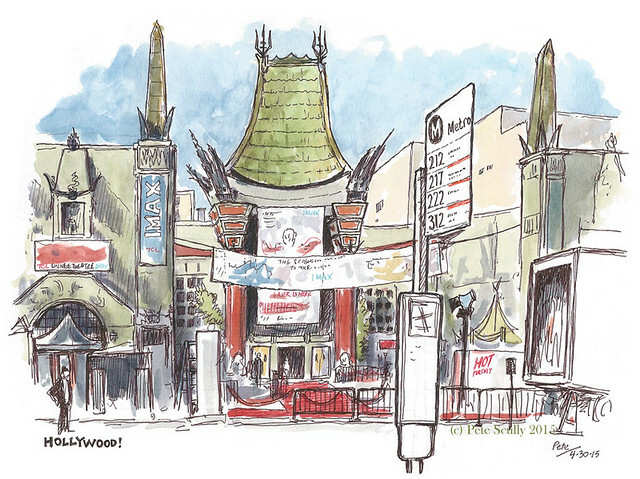 I wanted to sketch the world famous Chinese Theatre, made famous of course in Iron Man III. Ok it was famous before then. Note the bus-stop, I wasn’t leaving that out. A red carpet was being set up for the premiere of something, a small independent art-house movie called ‘Hot Pursuit’ which I presume is about the sadness of playing a game of Trivial Pursuit in a house where the air conditioning just won’t work. If it’s not then hey, great idea for a film, here’s my script Hollywood, MOVIE DEAL PLEASE. I sketched while Marilyn Monroe, Spider-man, and Darth Vader walked by, people dressed as space aliens and hookers (to be fair they may have both genuinely been either), and the occasional massive group of Chinese tourists. 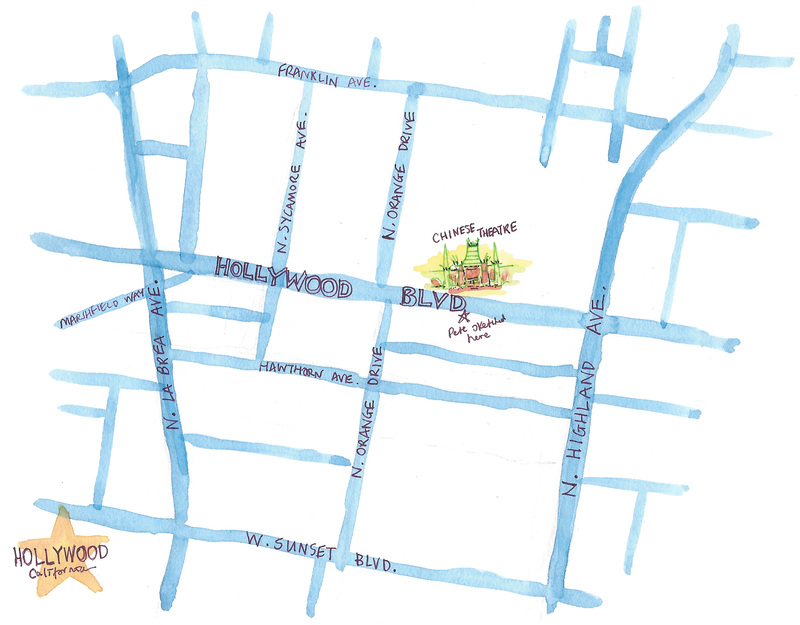 I have included a handy map in my sketchbook to show where this is located. This is the first page of the new Stillman & Birn ‘Alpha’ sketchbook I bought a couple of months ago, but I’ve been waiting to finish my current sketchbook before starting it. Well, I couldn’t wait, so after this sketch I reverted back to the Seawhite’s remaining pages for the other sketches. I’m not sure why I’m telling you all of this, you probably don’t care. Unless you’re some sort of Hollywood exec who sees a market in blockbuster movies about drawing in sketchbooks. I can see the trailer now. “He was a Sketcher, on the Edge…” etc. 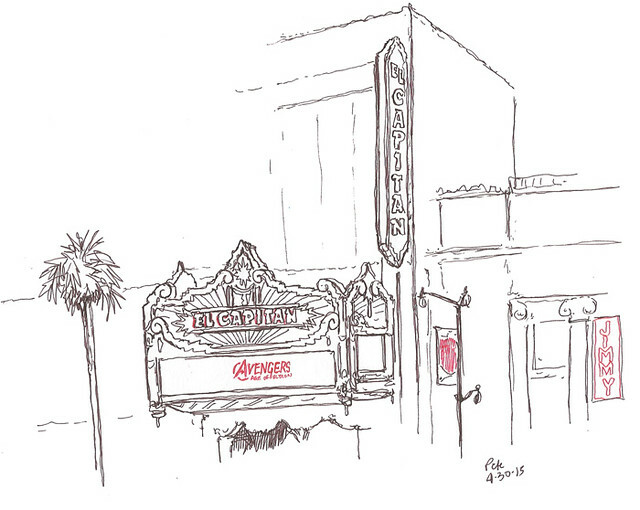 “Draw the El Capitan Theatre!” they all said. “You gotta draw the El Capitan!” Yes, yes I should, especially as they are playing Avengers there (the opening night was that same night). It’s really hard, the way I draw, to sketch that big neon sign, so I jsut went for the bare minimum before abandoning it. Perhaps I’ll give it a better go someday. Perhaps. But this is all you get. Fire hydrants! 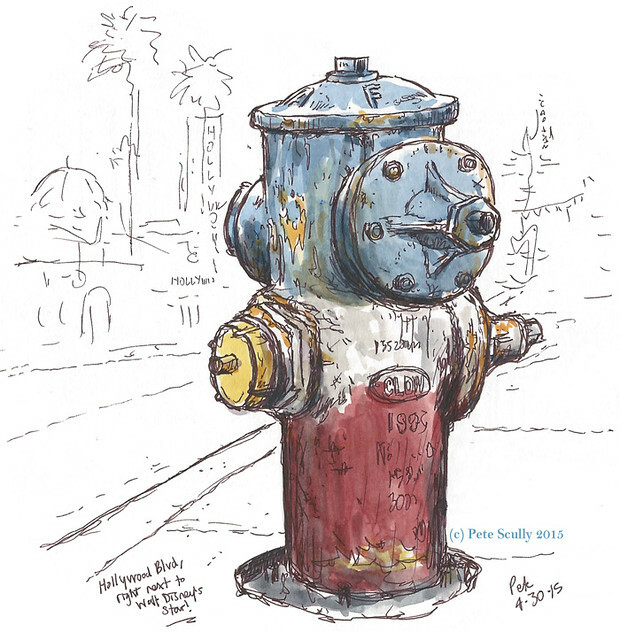 So, when you travel, well when I travel, it’s always good to sketch some of the local hydrants. This particular one was painted red, white and blue (and yellow), as were many on Hollywood Boulevard. 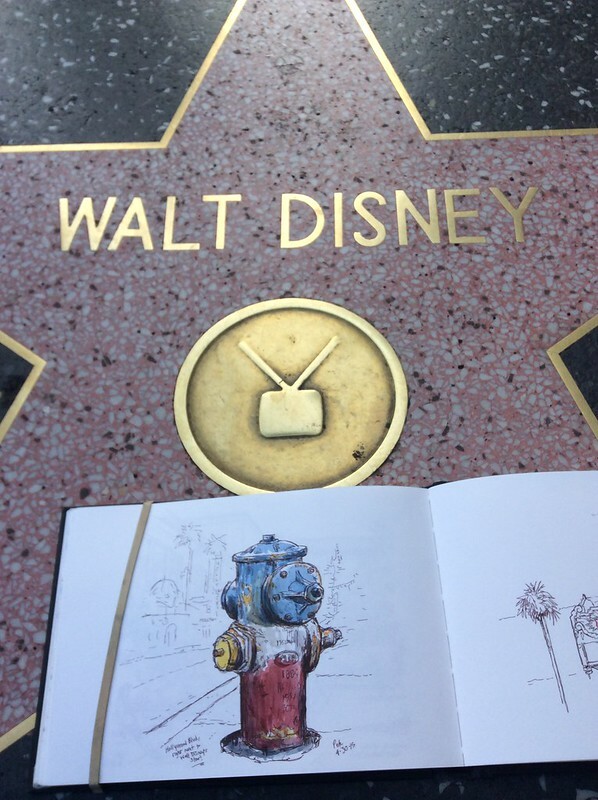 This one was located however right next to Walt Disney’s star on the Walk of Fame. Around me, star-spotting tour buses loaded and unloaded en route to peek at the gates of famous people’s second homes, while homeless people shuffled up to see why on earth I was sketching a fire hydrant. But this one’s a beauty, so I couldn’t resist adding it to my collection. I caught a couple of glimpses of the Hollywood sign up in the hills, but as the early evening pressed on I wanted to stop and rest my feet, so I popped into the interesting looking Pig’n’Whistle pub. I was going to have dinner (it’s a restaurant too) but opted for a pint and a sketch. The light from the street was pouring through the stained glass windows, but the itnerior was spectauclar – the ceiling was old and of ornately carved wood, it was like being in an old mead-hall, but with very Spanish-feeling decoration. Yes, I’d recommend stopping in here. After doing this sketch, I popped back onto a bus to Westwood, and had a late dinner before watching the UK general election leaders spouting nonsense on the TV in my hotel room. Happy travels! Wonderful sketches and love your commentary, as usual. 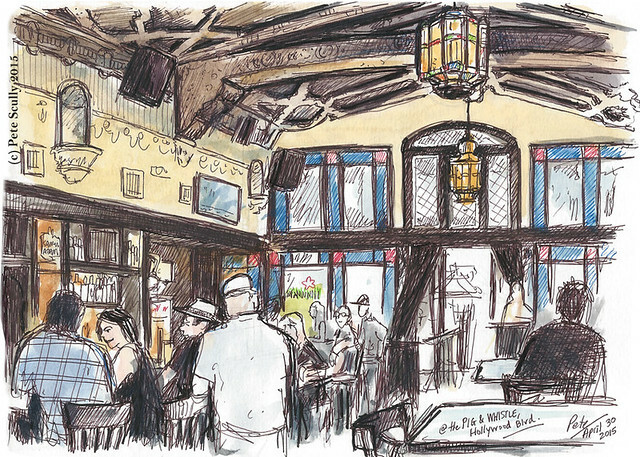 I have been meaning to comment on your Pacific Grove sketches…loved them. That place holds special meaning to us after countless trips with the boys. (Can you call your sons in their 30’s boys?) They use to love the tide pools. Thanks for the memories! Cheers Linda! Yes, Pacific Grove is one of my favourite places. I want to go there all the time, we love the little beaches there and all the rocks. The little house we stayed in was really nice as well, bit pricey but so welcoming. Loved the article and the drawings. Really good stuff. 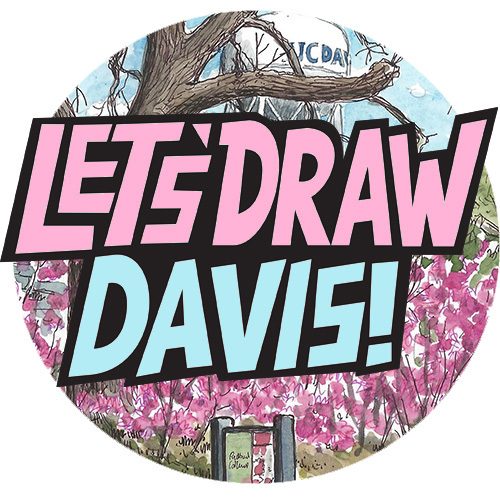 These are great – I envy your ability to always spot a good view (and the sketching, of course!). I was in LA too. Nice sketches.